The Papal History/Notable Individuals page is another area of the website that contains information and artifacts of many noteworthy individuals who have close connections with the Vatican, the Popes and/or Catholic Culture. Father Patrick Peyton is one such person who dedicated his life to spreading devotion to Mary and through his Rosary Crusade in the 1950s acquainted people all over the world with this prayer. We honor the memory of Father Peyton today and are grateful for the gift of his life to our Church. Patrick Peyton was an active youth who came from a large but “close-knit” family in County Mayo, Ireland where he was born in 1909. A small two-room school house was the humble setting for his early education. As a young boy his father’s physical limitations resulted in Patrick’s struggling to keep up with his school work while pitching in to make financial ends meet. Patrick sacrificed for the good of the family and was no stranger to hard work: whether on a farm, repairing roads, or cleaning a local pub his efforts helped keep the family afloat. But one time his youthful boisterousness got the best of him and he was fired after being caught by his boss while dancing with a broom! Each night the Peyton family knelt in the main room of the home and prayed the FAMILY ROSARY, as led by his father. 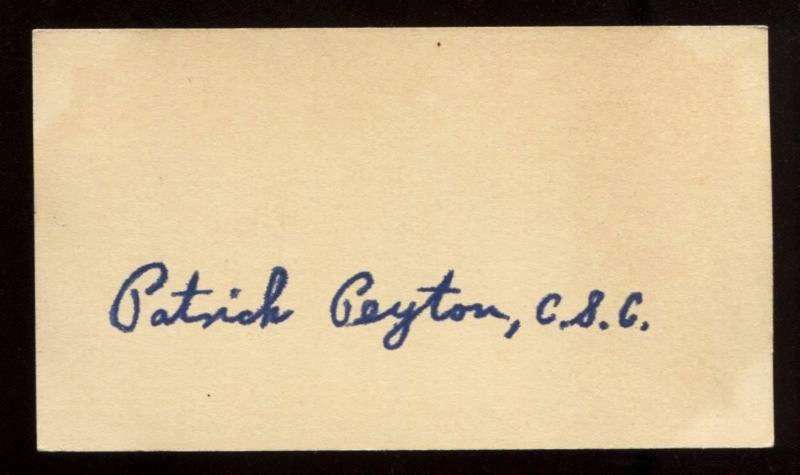 Patrick was the sixth child, out of nine in the large Peyton family. He developed a close relationship with his pastor and often served early morning Mass. Other young people found Patrick very pious, and it was in these early years that he grew very close to God. As the years passed Pat sized up the stark financial and life possibilities of Ireland in the late 1920’s and despite his deep love for his family, he realized his future lay in the United States. He moved to Scranton, Pennsylvania in 1928, having been instructed by his father to “be faithful to God in America.” His brother, Tom, went with him and the two stayed in their sisters’ home. When some Holy Cross priests came to preach a parish retreat, Pat and Tom presented themselves as candidates for the priesthood. Together they went to Notre Dame and studied in the seminary. When the two were in their second year of Theology study at Catholic University in Washington DC, Pat was stricken with life threatening tuberculosis. He languished for a year, having been transferred back to Notre Dame’s infirmary. There Fr. Con Haggerty CSC told Pat that he needed to pray to Mary the way the Irish always prayed, with great faith, knowing her to be alive and a “hundred per-center!” Pat prayed his rosary in that way, and at the end of a novena, declared himself cured by Mary’s intercession. The doctors eventually confirmed it, and Pat was forever grateful to Mary for saving his life and he would live to tell the world about this miracle. Pat and Tom were ordained together on June 15, 1941. Assigned to Albany New York as Chaplain to the Holy Cross Brothers, Father Pat began the Family Rosary Crusade, getting volunteer students and brothers to assist him writing letters to Bishops asking their help to organize a rosary campaign. Radio broadcasts of the Rosary followed. Fr. Peyton started giving “triduums”, weekend retreats in various parishes on the theme of the family rosary. The response was very positive. Albany, with its strong Irish Catholic population, was coming to love the Irish rosary priest! Father Peyton’s Cause for Canonization has resulted in his being named a Servant of God, the first step in the process. Much more detailed information about Father Peyton is featured on the web site, Father Patrick Peyton CSC, The Rosary Priest. Letters from many popes to him, videos of his life and worthwhile biographical information located there help to make this holy man come alive.